Higher costs of raw materials and import tariffs have increased operational costs and reduced overall profitability in the household appliances segment. Since the end of 2018 many consumer durables retailers have begun to reap the benefits of their previous investments, aimed at cost efficiency, enhancing e-commerce capabilities and the in-store experience for customers. Many companies have made significant investments in strengthening their omni-channel operations, with digital innovations along with store remodeling and refurbishments. Coupled with a strong economy and robust household consumption this will result in higher operating profits for those businesses. 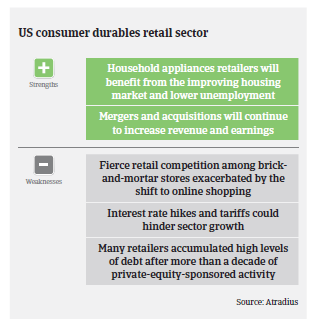 Accordingly, we have upgraded the business performance/credit risk outlook for the US consumer durables retail industry from “Fair” to “Good”. According to preliminary estimates of the National Retail Federation, retail sales grew 4.6% year-on-year in 2018, to USD 3.68 trillion. In 2019, we expect retail sales to increase about 4%, with e-commerce sales growing by about 15% and in-store sales around 2-3%. Currently accounting for about 15% of total sales, the share of online retail is expected to grow to about 20% in the coming five years. While Amazon will continue to dominate e-commerce, brick-and-mortar businesses will gain more of the online market share as they set up their own platforms. 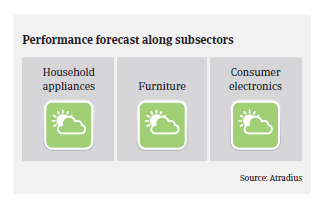 The household appliances sector is driven by increasing disposable household income, coupled with robust housing and construction activities. Sales are expected to increase by more than 8% in 2019, to USD 15 billion. Higher costs of raw materials and import tariffs on steel have increased operational costs, and reduced margins and overall profitability. However, companies are resorting to higher pricing and cost-productivity programs/cost-reduction initiatives in order to sustain margins. The US furniture market has been growing since 2009, and furniture sales are expected to continue to increase at least until 2023. A solid housing market and low unemployment has helped consumer spending for furniture. Online sales are further increasing at the expense of brick-and-mortar retail, as more than 90% of customers start their purchasing process online. According to the Consumer Technology Association, retail revenues in the consumer electronics segment increased 6% to a record-breaking USD 377 billion in 2018. Robust growth of about 5% is expected in 2019. We expect merger and acquisition activity in the consumer durables retail industry to slow down in 2019 compared to 2018, as businesses integrate recently made acquisitions. Retailers will curtail share repurchases until they have strengthened their balance sheets. While digitally-native brands plan to open about 850 stores over the next 5 years, traditional brick-and-mortar-based retailers closed about 7,000 stores while opening 3,000 in 2018. The closure process will continue, but will be partly offset by the expanding retail footprint of direct-to-consumer brands and other niche retailers better positioned to thrive in this environment. Brick-and-mortar is in the midst of a radical transformation. Emerging trends like cashier-less checkout, pop-up stores and data-driven merchandising have caused retailers to reimagine the retail experience for modern consumers. Payments in the US retail sector take 60 days on average and the number of non-payment notifications has been stable over the past 12 months, with no major increase expected in 2018. However, the insolvency level in the industry is still elevated. Over the last 18 months, the largest US business bankruptcies were concentrated in the retail sector, which accounted for five of the ten largest Chapter 11 filings. In 2018, businesses in the apparel segment and big-box retailers continued to use the bankruptcy process to rationalize their physical store footprint and to reduce unsustainable debt levels. In 2019, we again expect large national retail brands to seek Chapter 11 protection. However, we do not expect the number of retail business failures to increase substantially, as many troubled businesses have already filed for bankruptcy. 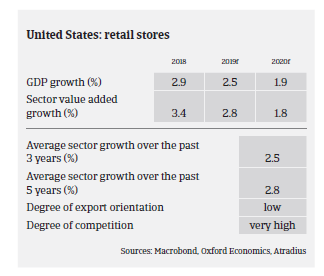 Mitigating factors are the robust economic performance and that many retailers have adapted to the changing market conditions. 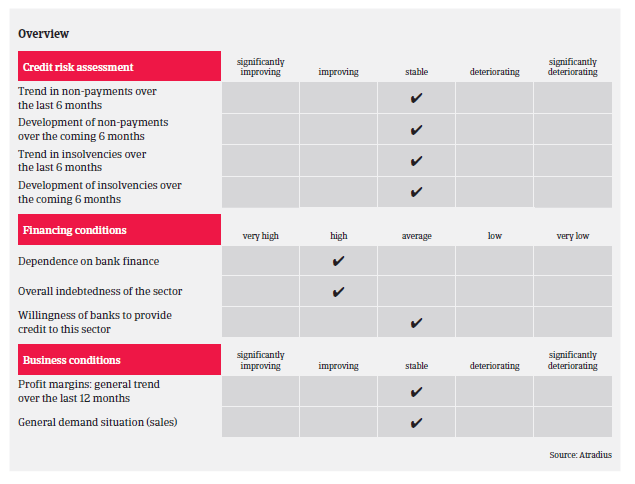 Our underwriting strategy for all main subsectors is cautiously optimistic. When analysing buyers the level of transparency into the products and their life cycle—including any insight into buyback arrangements for old or obsolete products—is key. With short life cycles and technology quickly becoming obsolete, it is important for us to know which end-markets are being served. Downside risks for the retail industry are a tighter labor market and increasing freight charges. In addition, a significant and prolonged escalation of the ongoing trade dispute between the US and China would negatively affect US retailers that import a meaningful portion of their products from China. Given the longevity of the current economic cycle with robust consumer spending since 2010, a softening of spending could occur over the next one or two years. This would more likely impact discretionary categories like apparel, household appliances and consumer electronics than staple categories like food. Highly leveraged retailers that have made major investments in order to adapt to the changing market conditions could face margin pressure and financial issues. Trade policy uncertainty is one of the top risks to US businesses and consumers in 2019 that may bring the next downturn on more quickly than expected.